Prepper EDC and Prepper Pocket Tech! This time on the GunMetal Armory, we’re talking about “EDC and other Pocket Tech”. 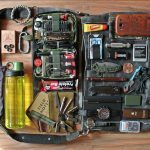 We go into what the average prepper might carry in their pockets, what they SHOULDN’T carry in their pockets, and the things that I would suggest that they do carry in their pockets. There are a lot of misconceptions as to what you “need” versus the things that you may want. There are a lot of products on the market that are simply unnecessary or are only there to help sell more stuff and make someone money. Listen to this broadcast or download “Prepper EDC and Prepper Pocket Tech!” in player below! One of the things that we need to take a look at is necessity over comfort. If we are aware of the fact that we need to be able to survive with the stuff that’s in our pockets, than that is what ends up being the most important thing. The stuff that we keep in our pockets and the stuff that we carry as a prepper makes a big difference. If you look at the things in your pocket and think of the things you need to survive… Fire, Water, Shelter, defense. So if we have those needs taken care of, the next needs that we think about are secondary to the immediate ones. We will discuss these things and more on the next Gunmetal Armory. Next: Next post: The Dying: Knowing when to let go!